Technological revolutions have had an unquestionable, if still debatable, impact on culture and society, perhaps none more so than the written word. In the legal realm, the rise of literacy and print culture made possible the governing of large empires, the memorializing of private legal transactions, and the broad distribution of judicial precedents and legislation. Yet each of these technologies has its shadow side: written or printed texts easily become static and the textual practices of the legal profession can frustrate ordinary citizens, who may be bound by documents whose implications they scarcely understand. Parchment, Paper, Pixels offers an engaging exploration of the impact of three technological revolutions on the law. Beginning with the invention of writing, continuing with the mass production of identical copies of legal texts brought about by the printing press, and ending with a discussion of computers and the Internet, Peter M. Tiersma traces the journey of contracts, wills, statutes, judicial opinions, and other legal texts through the past and into the future. 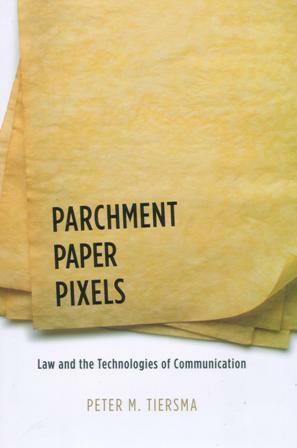 Though the ultimate effects of modern technologies on our legal system remain to be seen, Parchment, Paper, Pixels offers readers an insightful guide as to how our shifting forms of technological literacy have shaped and continue to shape the practice of law today. Peter M. Tiersma is professor of law at Loyola Law School in California. He is the author of Legal Language and Frisian Reference Grammar and coauthor of Speaking of Crime: The Language of Criminal Justice.